“It was our December holiday by now and the birds were building a new nest no more than five metres from our bedroom window. I watched in awe as they carted building materials along in their bills. The shallow open-cup nest quickly took shape. Plant fibres, rootlets, fine pieces of bark, dried leaves and even coconut hairs (from my potting soil) were used to construct their little home. To finish it all off, they carefully camouflaged the exterior with grey lichen, bound with spider web around the nest. The nest was placed about two metres above the ground in a fork of dead twigs at the end of a branch, right above a garden path between our garage and house. “The singing male started defending the immediate surrounds, even chasing another male fly-catcher away. Soon the courtship began: the male crouched with dropped wings and fanned, raised tail, quivering its wings and making soft calls. The female observed him attentively and both birds leaned towards each other. The male performed courtship displays, impressing the female with undulating flying passes, displaying the rich blue and browns of the upperparts and the elegant tail streamers. 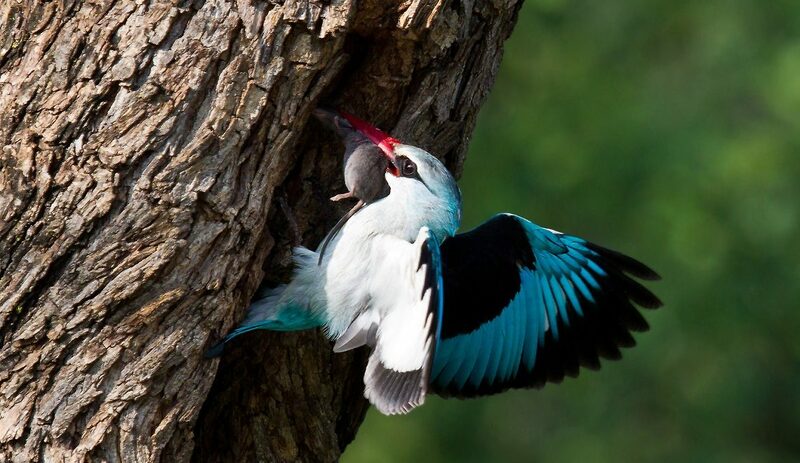 During these displays, the male called with the bill widely open to expose the bright colours of its mouth. This carried on for no more than a day or two. “Three eggs were laid and the incubation period started – both male and female taking turns. December was a very wet and stormy month, but they did not leave the nest. Through thunderstorms, lightning and strong winds they sat, even once enduring some hail. “Then, one morning, I saw the male flying towards the nest with a worm in its mouth. Within two days three chicks had hatched. The male and female still took turns on the nest and a feeding frenzy started. At first they fed the chicks with small insects, but these quickly became huge meals. It seemed as if anything that moved was caught and fed. Insects, beetles, moths, butterflies and even ants were on the menu. I also saw them feed the chicks a spider. A popular place to collect food was under a spotlight, early in the mornings when moths and other insects were still attracted by the light. At one stage a couple of red-winged starlings showed interest in the booty, but the male launched some ferocious attacks on them and the starlings left soon after. “The male was just as active as the female in the upbringing and care of the young, even when it came to ‘changing the nappies’. In the photos below he can be seen removing a faecal sac from one of the chicks. It was interesting to see him drop all these sacks under another tree which stood about 15 metres away from the nest. Have you unexpectedly come across wonderful and intriguing wildlife sightings? Email your experience and images to [email protected]. 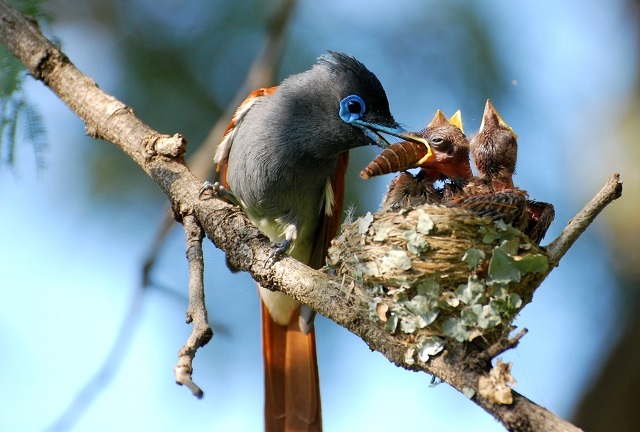 Read more about the clever nest design of African paradise flycatchers and other birds. Download the article by Warwick Tarboton in Wild 31.